Posted by Bravado Cooking for Men in Classic Mexican Dishes. In the U.S. we have decided to adopt and tweak Mexican cuisine. Tacos is the perfect example. This has to be the go-to dish for many busy parents – ground beef, a seasoning packet, some tortillas y voilá. If we have time, we put out little bowls of chopped tomato, cheese, sour cream and lettuce. Maybe we even buy a little container of guacamole. However, we should be clear about one thing – you will never find this concoction in Mexico. This is a purely Gringo deal. If you want truly authentic and classic tacos, you need to try salpicon. This is a dish from southern Mexico and also a favorite in Guatemala. 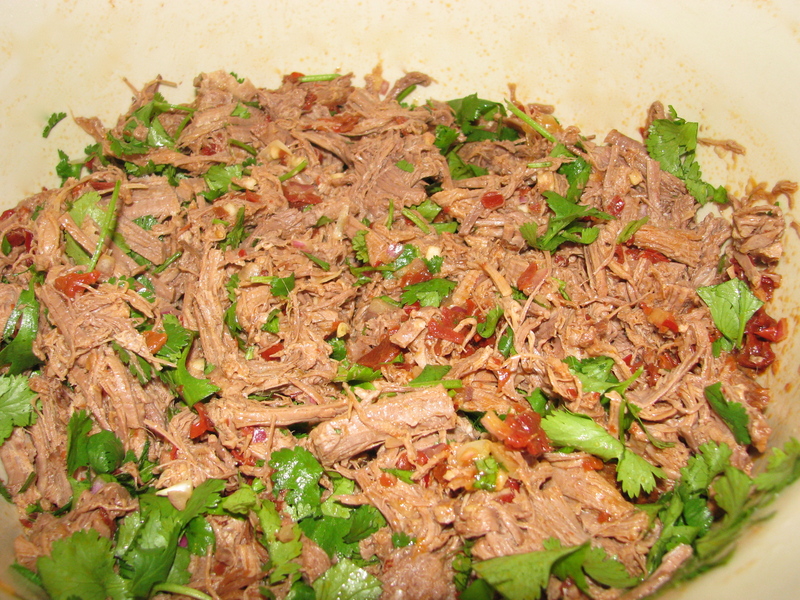 The base is brisket that is cooked in Mexican oregano and cilantro until very tender. It is then shredded, chopped into about one inch pieces and spiced with chipotle chilies and adobo sauce. Traditionally, it is served with guacamole and black beans with queso fresco. Brisket facts: Brisket is a prime cut and is actually the lower chest of the cow that lies between the legs. Cows have no shoulder blades and so this part of the cow must support a great deal of weight. As a result, it has many collagen fibers, which make it incredibly strong and also incredibly tough. If collagen is subjected to a low to moderate heat for an extended period, it dissolves or, more technically, gelatinizes. Water speeds up the process since it reacts with the collagen. When the collagen turns to gelatin, the meat becomes very tender. A whole brisket, called a “Packer’s Cut”, can weigh up to 10 lbs. or more and cost from $75 – $100. It usually requires a special order. A “Packer’s Cut” Brisket has a large fat cap on the top and another large layer of fat called the “deckle” running through the meat. A brisket is usually cut into two parts – a rectangular part called a “flat cut”, and a triangular piece called a “point cut”. The “flat cut” is what you will generally find in the supermarket. The fat cap will be trimmed off, but underside will have a small layer of fat that can be easily removed after cooking if desired. 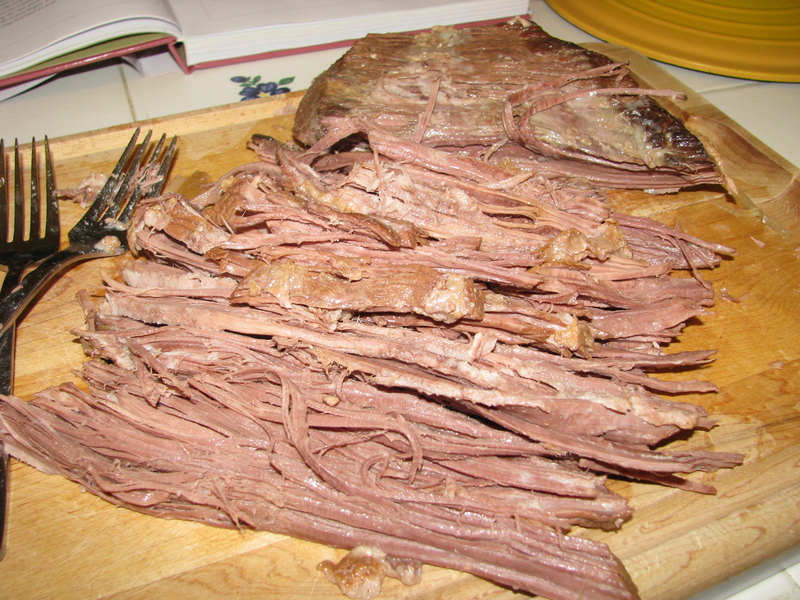 The “point cut” is less common since it is often sold to corned beef makers. This cut, if you find it, will have the layer of “deckle” fat running through it. Note that this is a moderately spicy dish, so an option with less heat is included below. Chipotle chilies in adobo sauce are roasted and smoked Jalapeño peppers that have been preserved in a sweet, tangy tomato sauce. As long as you remove the seeds, these chilies are not overpoweringly hot and really add flavor to any dish. There would be few cupboards in Mexico that don’t have this classic on hand all the time. 3. Heat olive oil in large saucepan and brown the brisket for about 5 minutes on each side. Make sure you have a nice golden brown crust. 4. Remove the brisket and deglaze the pan with water. Replace the brisket and cover with water. Add the onions and oregano. 5. 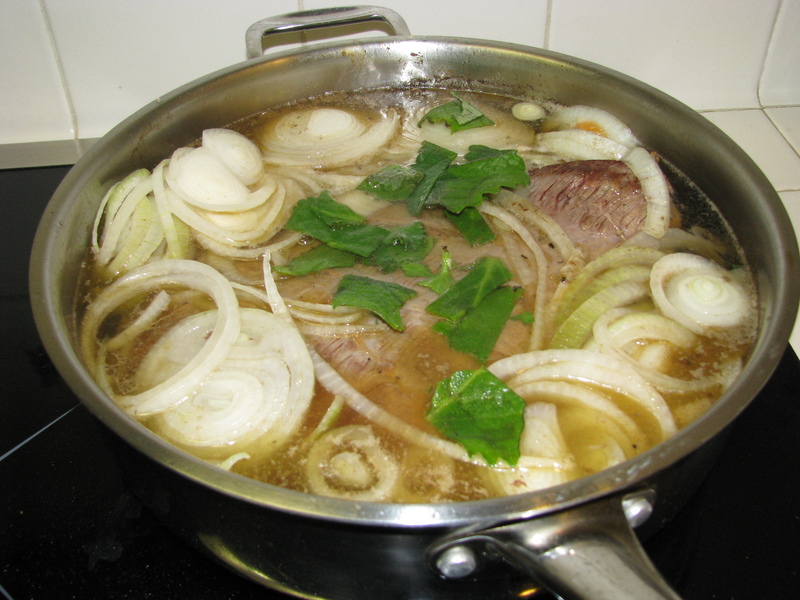 Bring to a boil, reduce heat to a slow simmer, cover and cook for 4 hours. 6. Use two forks to test the brisket. If the meat easily separates with the forks, it is done. Remove from the liquid and let cool. Save one cup of the liquid in the pan. 7. Lay the meat on a cutting board with the grain running horizontally in front of you. Using the two forks, pull the long strands of meat apart and cut into one-inch lengths. Put into a mixing bowl and add salt and pepper to taste. 8. Take as much meat as needed for the authentic but spicy version and put into a separate bowl. 9. Remove the seeds from the chipotle chiles, dice and add to the meat along with the adobo sauce, the reserved cup of braising liquid and the cilantro. Reduce the amount of chipotle if you are making a substantial amount of the milder version. 10. For the mild version, follow the instructions on the packet of taco spices and mix with the meat. 11. Serve with warm tortillas. Sprinkle with queso fresco. Everybody has their preferred way to warm tortillas. Here’s one you need to try since it may be the very best. Take the tortillas, fold them in half and put them in a toaster or toaster oven on a medium setting. They come out toasty on the outside and soft on the inside. They hold their shape and are perfect with salpicon.